Human stories have always been at the heart of disaster films, but a recent release questions whether humans deserve heroic status next to mighty monsters. Hollywood likes to play fast and loose with our irrational fears in its big budget blockbusters. In the 1990s it was asteroids (Armageddon, Deep Impact) and aliens (Independence Day). In the noughties, it was machines. Always at the heart of the films were the human characters standing up to adversity – Bruce Willis blows up that asteroid for his little girl, Will Smith blows up that mothership for his son. But as audiences demand ever bigger and better threats, what place do cinematic heroes have next to Movieland’s mega monsters? Even macho action master Michael Bay put people at the heart of his rock-em, sock-em robot film, Transformers (2007). His mega mechas are the ultimate power, yet puny human Sam Witwicky (Shia Le Beouff) is vital to their survival. Because of their link to Sam, the big ’bots fight to protect humanity, giving it tenuous control over the chaos. Pacific Rim (2013) had big robots too, pitting them, head to head against the Kaiju – enormous, relentless monsters of the deep with no agenda other than destruction. Still, at the epicenter of Pacific Rim’s thunder is the human duo, Raleigh (Charlie Hunnam) and Mako (Rinko Kikuchi), empowering the human made machines to tame nature. Godzilla (2014) director Gareth Edwards, however, is having none of that malarky. In his monster movie, technology and family story play second fiddle to the one about how we are nature’s plaything. 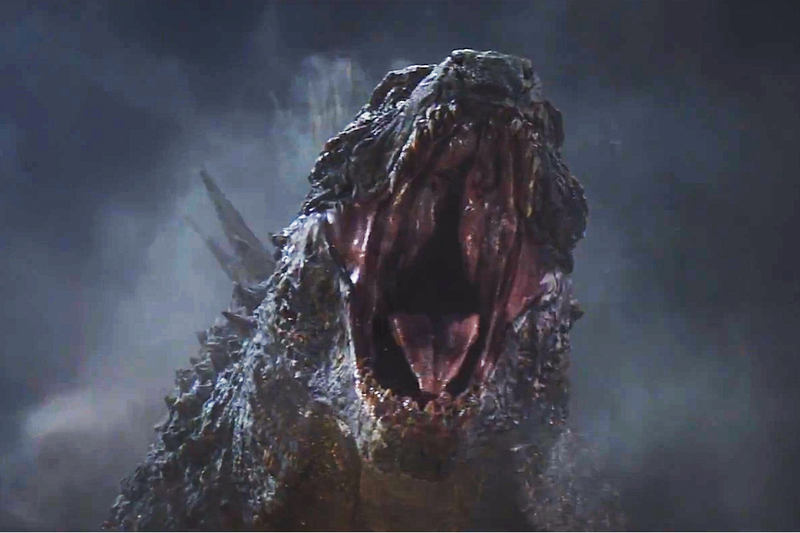 Exchanging the nuclear anxiety of the original 1970s films for modern anxiety about our place in the food-chain, Godzilla spends a lot of time making sure we know just how pointless we actually are. Starting by irradiating living goddess Juliette Binoche within five minutes of her turning up on screen and ending with Godzilla’s complete indifference to humans, Edwards has no interest in making us feel better about our prospects. His massive monsters smash, crash, and roll over our cities and lives as if we aren’t even there, swatting planes from the air like flies. Even our technology – in this case a hefty nuclear bomb – is just the next monster’s dinner. The final insult: the most touching romantic scene in the film isn’t even between humans. Edwards’ Godzilla seems to reminds us, bluntly, that humanity is tiny in the face of awesome nature. A recent report predicted that in 100 years, rising sea levels will render coastlines unrecognisable, we’re facing an extinction level event as vast swathes of life on earth die off, and it’s getting hotter. As Godzilla lumbers from the deep, stomping good guys and bad guys without distinction, laying waste to everything in his path, it’s as if Gareth Edwards knows there really is an unstoppable force of nature coming to get us from the briny. It’s not a 100-foot tall prehistoric monster that breaths ice-fire, but like Godzilla it will not care how big our guns are or how much we love our spouses and children. And it’ll run the show. I tried to take a different reading on Godzilla. To me the lack-lustre human stories kind of underpinned this idea that we’re actually completely useless in the face of nature’s biggest threats. Like, everything the human’s do in that film is pointless, they’re all completely ineffectual and the only one who says anything that make’s sense is the Japanese Doctor who says a bunch of stuff about balance and letting them sort it out. To me, there was kind of a deliberate disconnect between us and the people, transferred to us and Godzilla. Like, when he shows up to the battle the first time and roars, it’s legitimately exhilarating. They make a point of calling him “him” through out the whole film. He’s never just a monster, he’s a character in his own right. And he never once interacts with any of the people. There’s that one scene where Aaron Taylor Johnson gets up close to him, and they have a kind of eye contact, but it clearly means more to Johnson’s tiny any man than it does to Godzilla. I kept thinking about Cthulhu, and those elder gods, that Lovecraftian trope where we worship them, desperately, but to them, we’re meaningless.